Karate (空手) is a Japanese martial art. It was developed in the former Ryūkyū Kingdom in what is now Okinawa Prefecture. 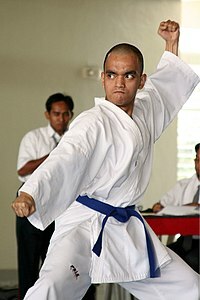 kumite (組手) is to learn how to fight using those techniques. Gichin Funakoshi, a school teacher from the island of Okinawa, introduced Karate to mainland Japan in the early 1900s. Traditional karate is different from boxing, wrestling and kickboxing: in karate, there is just as much importance on the strength of the mind and good manners as there is on strength of the body and self-defence to use when you're in trouble. Karate became more known around the world because of Karate movies in the 1960s and 1970s. Now people all over the world learn Karate. After World War II, Karate also became popular in Korea, where a local variation appeared, it is called "tangsudo". The full name of Karate is "Karate-do" which means "the way of the empty hand" in English. A person who does Karate is called a "karateka". Notable Karateka include: Gichin Funakoshi, Yoshitaka Funakoshi, Shigeru Egami, Masutatsu Oyama, and Fumio Demura. When people practice Karate, they wear special clothes called a karategi. The karategi is made up of a white jacket and white pants. People who practice Karate also wear a colored belt, which tells other people their rank. The belt shows how long you have trained rather than how good you are. Two people wearing different colored belts can be surprisingly similar. Different schools of Karate have different colours of belts for their ranks. You cannot know precisely how good they are without either asking them or knowing how their school arranges the belt colours in ranks. Usually the black belt is for the students who try very hard to be the best that they can be for a long time. Some schools have several degrees of black belts. They show this by having a white stripe, called a Dan, on the one end of the belt, for the black belt degree the person has. For instance a "3 Dan black belt" would have 3 white stripes on his black belt and would be higher ranked than a "1 Dan black belt". ↑ 1.0 1.1 1.2 1.3 1.4 1.5 Nussbaum, Louis-Frédéric. (2005). "Karate" in Japan Encyclopedia, p. 482. ↑ 2.0 2.1 Nussbaum, "Funakoshi Gichin" at p. 220. ↑ Nussbaum, "karateka" at p. 483. Wikimedia Commons has media related to Karate. This page was last changed on 31 August 2017, at 05:24.